Do you love snow? Are winter sports amongst your favourite hobbies? Do you like penguins, seals and polar bears? Have you always wanted to visit the North Pole? You can save your money from buying the plane ticket as Habanero is taking you to see the arctic wonders without having to leave the comfort of your couch. Here is your chance to do everything you ever dreamt of doing in this winter wonderland. You can play with your favourite arctic animals, go fishing with Eskimos, spend the night in ice igloo or enjoy the view of the fantastic Northern Lights. Habanero is making all of this possible in their icy video slot called Arctic Wonders. So grab the map and navigate your way to face the cold. The warmth of the winnings will melt the coldest of hearts. The amazing Northern Lights is the Wild-symbol, which substitutes all the other symbols except the scatter-animals. And this is all they do. The colourful lights will shine all over the reel once the symbol hits the reel. And even this is not all, as the beautiful lights will also shine the glory of the biggest win. The game has truly Arctic Wonders as it has not only one but two scatter-symbols. In this slot you don’t have to be worried when the polar bear stomps on the reels as it both carries a win in its paws and does the work a scatter-symbol. The cute penguin does the same. And this is not all as scatter wins are also added to line wins, so these wild creatures are something to keep an eye on. 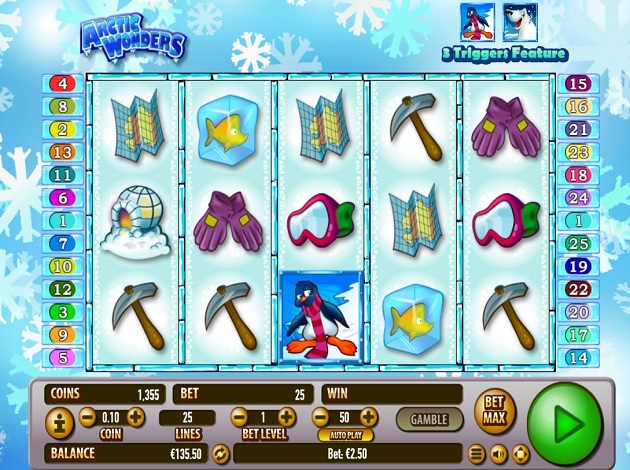 In Arctic Wonders video slot you will land on a win when you spin 2-5 or 3-5 same symbols on a payline from left to right. Arctic animals carry a bigger win than other items you need in order to protect yourself from the cold. You will need at least 3 items to land a win whereas the animals grant you a win already when 2 of them appear on the reels. The biggest win is granted by the smiling Eskimo and the stunning Northern Lights. 5 of either will increase your balance with whopping 10,000 coins. Game includes a progressive jackpot which can be won any time and is triggered at random. If you think that a Jackpot win is all you get you are wrong as Jackpot wins are added to other wins what you may score. This game truly offers you the best of the arctic treasures. The game title is Arctic Wonders and this is surely what the game is all about. Looking at the game there is no doubt that you are in the North Pole. You don’t need to worry about getting lost in the Winter Wonderland, as you have a map, proper winterwear and a jolly Eskimo as your guide. The reels are covered with ice and snow, and you will meet many arctic animals on your way, such as penguins, polar bears, seals and huskies. A true winter escapade! You will hear the sound of the spinning reels but that’s nearly all about there is. The music is frozen and so are the surroundings. But you don’t need to worry about getting cold as the ice igloo in the game provides shelter from the cold. Here is your chance to make a trip to Winter Wonderland and hit the North Pole! Smiling Eskimo is there to guide you throughout your journey on the never ending icy landscape. You can explore the icy surroundings without a worry in your mind, as you know that if crossing paths with a polar bear you will both earn some coins and enjoy the Free Spins. You have the same pleasure when spotting the cuddly penguin and when you spot the Northern Lights the whole reel will be shining as a Wild symbol. Pack your gear and start the icy escapade!